There is no doubt in mind that Eddie Redmayne will receive an Oscar nomination for his performance as Stephen Hawking. His is definitely one of the best performances of the year, as well as the best performance of his career to date. I am uncertain about Felicity Jones’s chances at Oscar gold, however. While I feel that she gave a very good performance, I think that she is overshadowed by her costar. 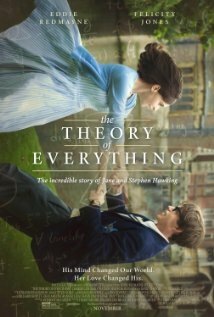 In a way, I feel that the writer’s cheated the character of Jane Hawking; where this is just as much her story as it is Stephen’s story, if not more so than, her character is relegated to secondary steppingstone, rather than leading lady. However, I think Felicity, herself, is just as much at fault; she portrays Jane as more of a meek woman, powerless against her own lust and selfishness. Additionally, Charlie Cox’s portrayal of Jonathan Jones is, at first, one of dogmatic arrogance and condescension; he plays him so that we do not like him, but then switches gears when he starts taking care of Stephen. There are no persons of colour. While Jane Hawking is presented as a sharp, intellectual, and independent woman, she is portrayed to be meek and, at some points, austere. The only conversation between two women in this film is about a man. The musical score was so beautiful, it was mostly to blame for my tears. I wanted a bit more than what we were given. Maybe not more, but something different. I’m not really sure what. It felt overly long in spots. Here we have another film that seems to have been bred for the Oscars.